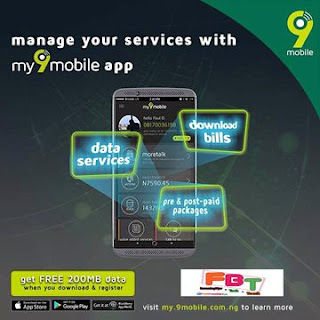 My 9mobile Mobile apk Gives you access to manage your account, Purchase data plan, Check phone number, Opt-out or Opt-in a service, borrow airtime, Share data with friends, check data balances, Check airtime balance, enable and disable features and more. With My 9mobile app, you will get free 200mb data instantly within the next 24hrs to browse on your 9mobile sim for 3days if this is the first time you're about to download and use the app on your Android device or smartphone. To get your free 200MB data from 9mobile all you need is very simple, just follow this simple steps below to activate and get your free data today. 2. Once My 9mobile Apk Download successful on your device, Kindly Install and launch the app from your phone and Register with your Etisalat (9mobile phone number. 3. Once Registration completed, don't worry, you need to wait for at least 24Hrs Before your number will be credited with Free 200MB data valid for 3days.